A center of American jazz and African American arts since the Civil War, Tallahassee, Florida’s Frenchtown suffered under the weight of the 1980s street drug culture, notorious for violent crimes and directionless youth. Today, through the efforts of teachers, volunteers and passionate young people change is most certainly afoot. The Tallahassee Food Network’s urban youth iGrow-Whatever You Like program and its Dunn Street Youth Farm offers character development, healthy food options and sustainable agriculture education, a trifecta that’s transforming lives in this historic neighborhood. “Over the months we’ve been able to see these young people develop a certain level of character and a certain level of integrity about them to where now, they are able to not only work with other people their age, but they can work with the older students that come to volunteer from the colleges and actually guide them and teach them,” says Sundiata Ameh-El, co-director of the iGrow program overseeing the work at the Dunn Street Youth Farm. A former classroom teacher, Ameh-El saw the cultural shift towards sustainability and looked for a way to become involved. While chaperoning a community garden tour for YELDA (Youth Empowerment and Leadership Development Academy) in 2011, several teens asked if they could start their own urban farm. In the last year, Dunn Street Youth Farm, housed on a vacant residential lot, has flourished into a thriving sustainable business serving the local community and teaching real life job skills to young people from 14 to 21 years. Comprised of multiple raised beds growing seasonal vegetables, fruit trees and a perennial flower border, the Dunn Street Youth Farm is an oasis of calm in the Frenchtown “D Street” community. Much of the hundreds of pounds of harvested food are sold on their “pick to order” work days and the teens keep the accounts, serve the customers as well as conduct farm tours and grow the produce. They have learned about square foot gardening, composting and the importance of eating raw fruits and vegetables. “Whenever you can get a young person to just walk up to a broccoli plant and just pluck it and eat it then you know you are actually making a difference in a child’s life,” says Ameh-El. One of the most popular programs from the Dunn Street Youth Farm is their iGrow buckets that make urban container gardening easier. The young folks sell the bucket gardens as well as t-shirts, worm castings and compost to increase revenue while building brand awareness. The “iGrow” concept is a nod to the modern tech culture while the motto “Whatever You Like” is a modification of a rap song chorus lyric. The youth’s sense of ownership of the farm and its products is a large part of the farm’s success. 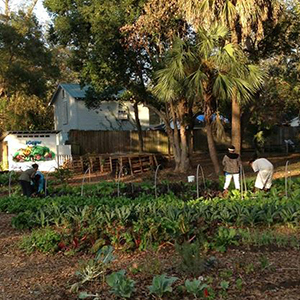 Last year, the Dent Street Diggers community garden was established in an adjacent lot. A pathway through the garden and farm to local businesses is preserved and maintained by both groups allowing public access through the gardens and encouraging people to enjoy the green space. A “giving garden” where volunteers plant vegetables around the base of a tree is also maintained here, and the food harvested is donated to area families and food banks. “It’s like a vortex. It feels cleaner, it smells clean. It feels like a little oasis in the middle of this community,” says Ameh-El.